DENTAL IMPLANTS : What types of implant are used today? Modern implants consist of an osseous part that interacts with the bone, a transmucosal component that interacts with the mucosa and then the restoration; this can be a crown or bridge abutment, or anchors for dentures. In recent years, there has been a vast amount of scientific development in implant design, geometry, materials and techniques in order to improve the ease of delivery and success of implant treatment. The majority of designs are cylindrical, or root form in geometry and almost exclusively endosseus, i.e. placed within the alveolar bone rather than subperiosteally or intra-mucosally. Surfaces are normally roughened (microporous) through use of surface preparation (e.g. sand blasting and acid etching) rather than being coated to increase the surface area available for osseointegration. Great majority of modern root form dental implants are “threaded” in design although the thread pitch or profile can vary significantly between manufacturers. Micro-threaded implants employ small threads around the neck of the implant to engage the dense cortical bone better and to distribute occlusal loads more optimally. This has been shown to reduce the shrinkage of the crestal bone through enhanced biomechanical fixation and loading. Other implants use different thread designs to improve their stability, particularly in softer bone. Implant surfaces also show variations. Surface hydrophilicity enhances adherence of biomolecules and promotes the initiation of the osseointegration process. Almost all modern implants today have a microporous (rough) surface rather than a relatively smooth machined surface. Roughness increases the surface area available for more “bone-implant contact”. Some implant surfaces are treated with bioactive substances such as fluoride to enhance the process of osseointegration. One implant system uses laser etching to promote adherence of hard and soft tissues to the shoulder portion of the implant as it emerges from the crestal bone. It has been suggested that this can help to resist apical migration of the peri-implant tissues. Macroscopically, an implant may or may not have a polished collar that protrudes above the crestal bone into the soft tissues. Implants that are fully inserted within the alveolar bone are known as “bone-level implants”. Restorative components are designed to fit on top of the implant (external connection) or within the implant (internal connection). If an abutment larger in diameter than the diameter of the implant is used – this is known as “platform switching” which has been shown to offer distinct mechanical and biological advantages. Clinicians need to be aware of the different implant design features as each implant might require different clinical and radiological monitoring particularly with respect to the position of the bone in relation to the “shoulder” of the implant. In case of bone level implants, the crestal bone stability should be measured with reference to the shoulder of the implant where as for implants with polished collars, the bone margin should be measured from the rough/smooth junction of the implant collar. Different implant designs and procedures are being introduced constantly as implantology continues to evolve. These new products have been subject to varying levels of research and development and clinical documentation with the implications that some materials or procedures may prove to be less reliable or safe in routine use. Since clinicians are bound by ethical and medicolegal responsibilities, the onus is very much on the treating dentist to select the most appropriate procedure or material depending on individual circumstances. In accordance with the current training standards guidance by the GDC, clinicians must ensure that the treatment they offer and undertake must be evidencebased and patient-centred. The dentist must also use a contemporary decision-making process to critically appraise new products and techniques before using them, and must ensure they follow current clinical consensus. If an implant lacks any outer threads this is known as a “Push-fit (non-threaded) implant”. Threaded implants, on the other hand, could be solid screws or hollow screws in design. Also screws can be self tapping and non-self tapping. 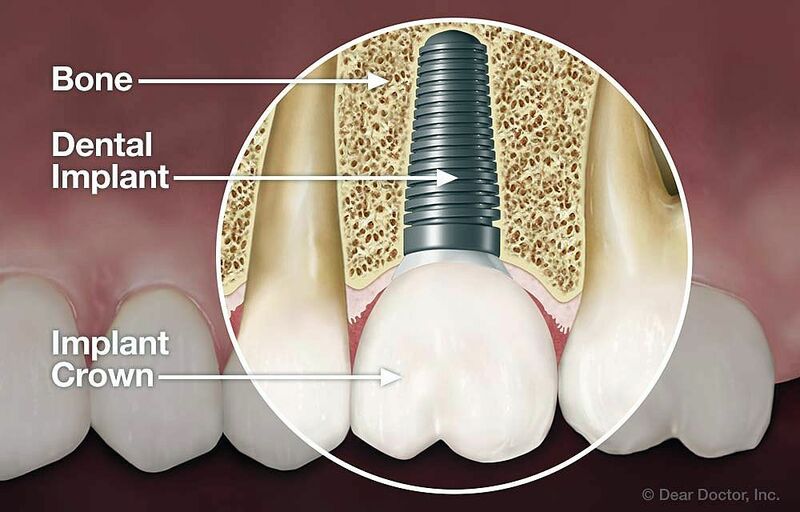 Most modern implant designs are threaded root form screws. Implants are classified according to their general diameter in cross section. Implants can be “tapered” or “parallel sided” in profile. Some surgeons prefer parallel sided fixtures whilst others use exclusively tapered ones. There is no convincing evidence to suggest that one is superior to another design.